Renowned for his symbolic portraiture, artist Andrew Salgado contrasts - briefly - the fragility and mental state behind his earlier archived artworks, and opens up to us about the new realm he's exploring that has guided his recent paintings. Salgado’s pieces commonly acquire an abstract style which is a trait that's become a signature to his aesthetic. He's been recognised for his craft globally, exhibiting work around the world throughout his career; gaining praise from The Lieutenant Governor’s Arts Awards in Saskatchewan in 2013 where he was awarded the ‘Emerging Artist Award’. The Canadian artist now bases himself in London and has done since he completed his Master of Fine Arts Degree from Chelsea College of Art & Design in London in 2009. With two new exhibitions in the pipeline - Dirty Linen & The Nihilist’s Alphabet - Salgado takes us through some of his footsteps from the initialising, to the finalising of his latest works. Ahead of your latest exhibitions, Dirty Linen & The Nihilist’s Alphabet, can you tell us a little bit about where you derived the inspiration from? 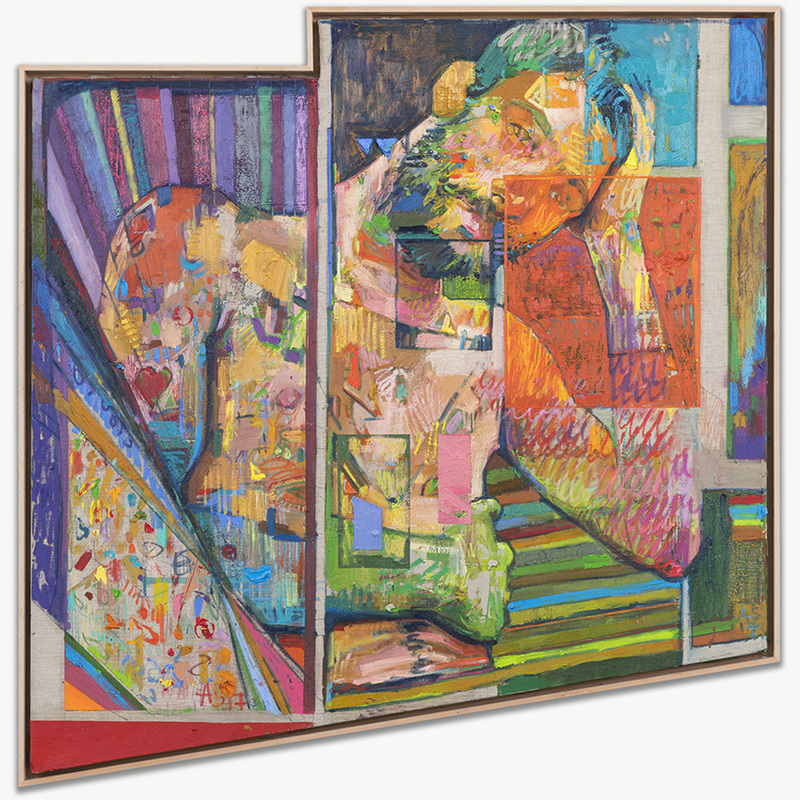 Andrew Salgado: I did two separate shows [with] two separate titles, but they're linked - there are obvious connections. But it’s hard for me to switch gears, mentally, when I'm working. [My] paintings have a tendency to want to fit together in a very connected, cohesive way. The Dirty Linen show is all paintings on linen. [Which is] the first time I've forgone canvas altogether. The canvas wasn't speaking to me [and] it wasn't responding to where I’m at or how I am making. So, the linen became a point of departure for me, and that technical and formal aspect became my guiding light. I've spent so much time - maybe too much time - in my young career talking about really weighted, ugly, personal and painful issues, that for the first time [in my career] I really wanted to get away from that. I didn't want to make work that had some big conceptual, overarching theme or political statement - and I'm okay with that. So, I focused on the materiality of the works themselves and let that guide me. The Nihilist's Alphabet works are the [art]works on paper. [There are] twenty of them that sort of remind me of one of those picture books you give to a child to learn. You know [the books that have] “A is for Apple”, “B is for Boat”… That sort of thing but kind of subverted, sort of perverse like “L is for Lemonboy”; “D is for Dark Rainbow”; “S is for Summer of Love”. I like macabre ideas… [as though] I'm guiding the viewer, but I've stopped directing them. I want the viewer to come to their own conclusions, and each of those conclusions is right. Who am I to say it’s not? Is this to say that the works are not about anything? No. They are about plenty of things, but I think it’s safe to say that I'm being a lot more coded in my intentions, or letting the paintings reveal themselves to me as we progress - together. A lot of musical references come through, because I'm in the studio 8-10hours a day. The music becomes something that intoxicates [me] and sways my methods of making and thinking. I also wanted to preach less and explore more freely, and this [method] has allowed me to do that. A lot of your artworks have symbolic meanings, can you tell us about some of the issues you express in your paintings and why they are important to you? AS: I don't know. I mean, yes they do, but I don't think this is as intentional as much as it is something that arises and evolves organically. I like the idea of hieroglyphs and language… How semiotics develop and translate, and become a system of signs that we can continuously decipher. These symbols tend to change from show to show, and sometimes [they are] more about a greater idea than they are an actual pictorial referent. Sometimes it’s about a way of mark-making. I equate the process of painting to a language and so, like a language, these ways of communicating come through in patterns. I think that is why each show - each body of work - tends to feel distinct from the one that came before it. I'm evolving, every day in the studio, and the works reflect that learning curve. Can you tell us what keeps your inspiration and motivation to paint alive? AS: This is both a good question but [it is also] somewhat hard to answer. It’s an obsess, right? It’s a compulsion to create, to make and to better oneself - a constant beautiful struggle to 'make'. Bjork said something once along the lines of her goal [being] to make the “perfect song”, and though she knew she never would, she'd “never stop trying”. I think that’s an extraordinary way to look at creativity. There is no 'culmination', no goal apart from the journey itself - that is such a wonderful idea in itself. You have created some beautiful artworks throughout your career, which of them resonates with you the most? AS: Beautiful is a scare word in art, don't you know that!? But actually, I'm not opposed to using it to [my] describe work. I like beauty [and] I'm okay with embracing that. What does [beauty] mean anyway? Right now, I think words like “cruddy”… “murky”… “ugly” and “crass” are beautiful. The texture, the dirtiness, the “cruddiness” of a surface - those [to me] are beautiful things. This is a very hard question for me to answer - very King Solomon -esque. I shouldn't answer, but sure there are pieces that have stayed with me or hit me harder than others. Or [there has been] pieces that have [had] great hurdles for me to overcome, or [that have] provided that proverbial 'eureka' moment, but it’s not fair for me to state that explicitly. I do often say - and fundamentally believe - that the work I'm producing now has to be the most relevant. I have actually pulled out of magazines, or write-ups, that come to me that want me to talk about work I made in 2012. It’s not relevant to my production. When I'm dead, sure, talk about these works. Right now, I'm still very much alive and I have no interest in talking about something I did 4 years ago. I want to talk about where I'm going, not where I've been. Holding a paintbrush can be quite therapeutic, do you find that painting can be a mental release for you? AS: Yes, it can be. I've recently started yoga, and this is a great release also [for me] to remain focused and calm. I think painting is a really meditative act. I feel very connected - as cringe-inducing as that sounds. But I am alone with my music and my paintings for prolonged periods, and it’s almost like a retreat into my own creative pathways. It’s nice when that feeling of 'flow' comes and everything gets blocked out, and I become hyperaware of the creation. Are there any areas/issues you plan to express through your artworks in the future? AS: Yes of course. I just don't know what they are yet. Can you underline the significance behind your technique as an artist? AS: I am applied. I work, rework, overwork, and then come back and work at it some more. I don't look at that as a bad thing. But I'm not washy, spontaneous, and 'okay done'. And there seems to be this type of mentality today in the art world, that painting [in this style] is frowned upon. I'm not that irreverent in my technique. I like the idea of going back in and developing, and further exploring parts of a painting. That is part of my strength and my namesake as a painter, and I want to embrace that. I see a lot of artists working in a certain way, and that’s fine, but don't misinterpret my modes of production as a weakness. Stylistic choice is not wrong even if current trends deem it so. This sense of stubbornness and directive has gotten me to where I am today. I feel very capable as the painter I am, and the choices that I make regarding my technique, because it’s taken me 35 years to get here. Despite this, I also feel like every day provides something new to learn and I am a porous entity, and style should evolve and change. If it doesn't, then I'm not challenging myself. Can you share some wisdom to any growing artists on how they can succeed? AS: Work harder. Answer your emails. Paint more [and] think less. [And] don't expect too much, too soon. What makes Andrew Salgado a success? AS: I have no idea - I'm not a jerk! I mean, I don't think I am? [I guess] love thy neighbour [and] put a friggin smile on your face!